The day many undoubtedly believed would never arrived is finally here! 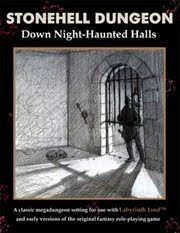 The sequel to the original Stonehell Dungeon: Down Night-Haunted Halls is available for purchase via Lulu in both hardcopy and PDF. Stonehell Dungeon: Into the Heart of Hell is the long-awaited sequel to Stonehell Dungeon: Down Night-Haunted Halls. 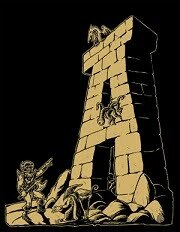 This book contains the final five dangerous levels of the titanic megadungeon, revealing Stonehell’s most terrifying secrets. 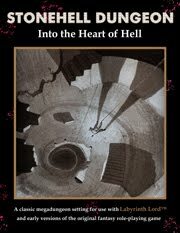 Stonehell Dungeon: Into the Heart of Hell contains almost 600 dungeon rooms filled with monsters, traps, and treasure for the players to explore, more than 70 unique monsters to challenge them, and 13 new magical items to mystify them. This book also contains complete information on the dungeon’s sinister master, the nixthisis, and full details on the mysterious chthonic substance known as Vaedium. Stonehell Dungeon: Into the Heart of Hell is part of the Stonehell Dungeon series of adventures detailing a classic-style megadungeon intended for use with the Labyrinth Lord™ role-playing game, but easily adaptable to most early versions of the original fantasy role-playing game and its retro-clones. Stonehell Dungeon gives the game master all the necessary information to run his players through the dungeon, while offering enormous opportunities to customize and expand on the site. This is not a stand-alone product. 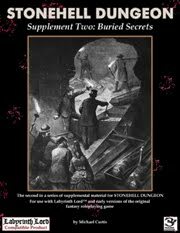 Stonehell Dungeon: Down Night-Haunted Halls is required to get the full use out of this adventure supplement. Truth in Advertising Disclaimer: There are less than a dozen instances in the printed version of this supplement where the numeral “7” is distorted due to Lulu’s printing methods. Despite numerous efforts to resolve the issue, it persists. The distortion doesn’t affect the usability of the supplement, but if this minor glitch might impact your enjoyment of the book, please consider purchasing the PDF edition. Color cover, b/w interior, 168 pp. Outstanding. My order is in. Nicely done, Mike. Color me stoked. Into The Heart Of Hell is being inserted into our 1E AD&D sandbox, south of the Crowhaunt Mountains (and east of Blackpool), where the entrance to Stonehell Dungeon waits to be discovered by those who venture deep into Stonehell Forest. Been waiting for this and now I can't wait to get it into my grubby hands. I got the print copy, and it seems excellent on a quick flick-through and random room/monster inspection. The 7s in the titles do look weird (so does the x) but it didn't do more than send me here to see if if was a known glitch. Jelly babies and wheezy more than make up for it, adding color and flavor :-) Keep up the good work. I've been running Stonehell for almost a year and I COMPLETELY LOVE IT. I have a question though! Is it possible to get copies of the maps without any of the keys on them? I want to print out the maps and tape them together for my players and don't want to have to go through the trouble of Photoshopping them all, room by room, if I don't have to. And thanks for all the wonderful hours of fun you've given us so far! 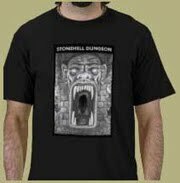 Been running Stonehell a while* now and really really enjoying it, to the extent that I've rather soured on other RPG products! Just can't take the wall-of-text format after the Stonehell style. I've never felt so energised as a GM as I do after running Stonehell. Any plans for additional supplements/dungeons in similar style? *Levels 0 1 & 2D, plus several sessions in the Brigand Caves - and we recently had an expedition into Modnar's Cellar.